Colette Loll is founder and director of Art Fraud Insights, a consultancy dedicated to art crime lectures, training, and specialized investigations. She trains Federal agents in forgery investigations and recently was selected to develop a proactive anti-­fraud initiative for eBay, the largest online art marketplace in the United States. 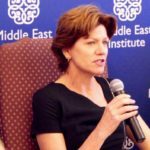 She is currently a Senior Advisor to the SmartWater Foundation, which is providing traceable forensic protection to cultural objects at risk. 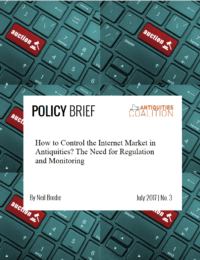 In the Antiquities Coalition’s latest policy brief, Dr. Neil Brodie takes on the “out-of-control” internet antiquities market, which he warns “presents a clear and present danger to the survival of the world’s cultural heritage,” by increasing public demand for looted and stolen artifacts. Ms. Loll, as the founder and director of Art Fraud Insights, you’ve worked closely with the online art market, developing a proactive anti-fraud initiative for eBay that identified Suspect Sellers and quantified the vast number of listings in the Art Marketplace that contained deceptive information and were in violation of the Art Selling Policy. Do you sense a growing awareness in the legitimate market about the illicit trade in ancient art? I think many people are still shocked to hear the scope of it. However, with all the press related to this issue, it is harder and harder for anyone to claim an innocent owner defense. 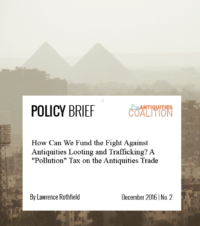 There is no excuse for not understanding the importance of proper due diligence when purchasing antiquities. However, one issue that remains is that the definition of what constitutes “proper due diligence” is still very broad and subjective—and many don’t think this applies to online sales. Obviously, online sales are not exempt from proper due diligence practices. In his brief, Dr. Brodie warns that cultural racketeering is putting both online companies and consumers at risk of unknowingly facilitating criminal activity, or even funding violent extremist organizations like Daesh (ISIS)? Based on your experience with art dealers and collectors, how big is this risk, and is enough being done to address it? Selling policy, with misleading, omitted or incorrect provenance information being one of the largest offenses Sellers make. I don’t think enough is being done to shut down the Sellers that are known bad actors. Many of them are well known to the industry for their illicit practices, yet they continue to operate unimpeded by online marketplaces that are reluctant to police their own sites. Or simply don’t have the resources or knowledge to do so effectively. It’s a very time-consuming process to scan listings and report offenders. It takes specialized knowledge. In response to these risks, Dr. Brodie has proposed a number of possible solutions, aimed at raising consumer awareness and introducing workable regulation. It is his hope that these would encourage the emergence of a legitimate trade, while beginning to rid the internet of looted and faked antiquities. What are your thoughts on these solutions and what else can be done? I think we need to start with a broad consumer awareness campaign aimed at affecting the demand side of the equation. Like what the Fashion industry did when collaborating on its “You Can’t Fake Fashion” campaign aimed at consumers buying cheap knock-offs online. Luxury brand manufacturers are aggressively trying to fight the growing problem of counterfeits by educating consumers that these products compromise the rights, revenues and reputation of manufacturers, not to mention contribute to unfair labor practices and organized crime activity. The stakes are even higher with illicit antiquities, as our collective cultural heritage is at risk. We need to start making the public more broadly aware—this should start with the major online retailers.